Fabric Banners - Website of jengstudios! 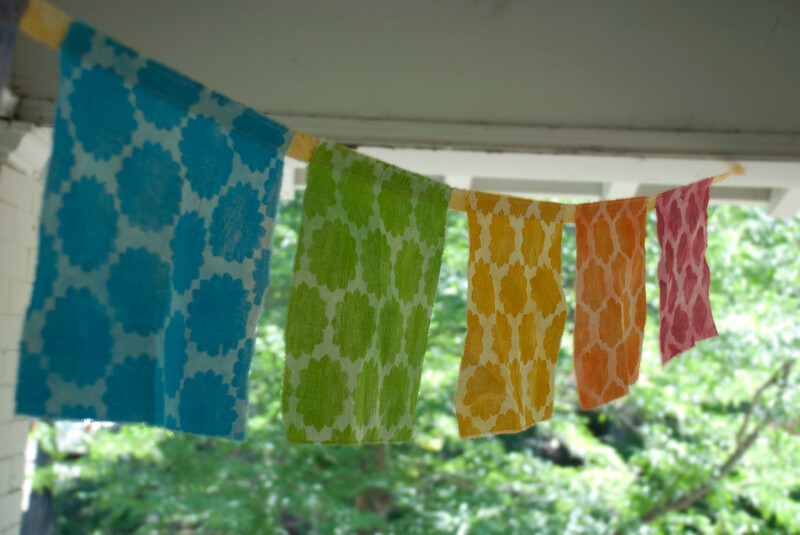 Inspired by Nepalese prayer flags, these cheerful fellows will bring a glimmer of joy and peace wherever they hang. Mixed media: screenprint, woodblock, acrylic wash.
7 feet wide, each panel is 6" x 6". Goes great across a wide doorway or to brighten up a porch. Will brighten any room or space! Set of 3 different vignettes, handmade original print on fabric. Each panel is 6" x 6"
Created in a limited edition, order today, before they all fly away! Made by hand in Denver, CO by yours truly. Chakra Banner - patterns and colors inspired by the 7 yoga chakras. Each panel measures 12" x 12". Banner is approx 10 feet long. Will brighten any room or space!